I’m not usually one to chastise an open source product compared to a proprietary one, but it’s hard not to notice the aesthetic differences when looking at Open Office beside Microsoft Office (2007 version). Absolutely, it’s more important to consider the functionality, compatibility, and ease of use of any piece of software; but at the same time if you’re spending long amounts of time using something, it can help if it looks nice at the same time. 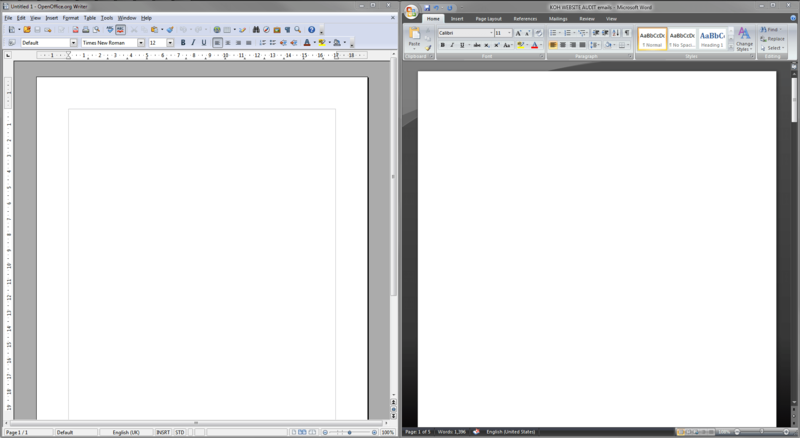 OpenOffice definitely loses in the looks department at the moment. Whilst there is some functionality for changing colour schemes through Tools > Options >Appearance, trying to find pre-made colour schemes on the net proved futile after ten minutes searching, and these colour scheme won’t address some more fundamental aspects of the look of the software. If you think it’s broken, you can contribute! Yes I know, but I just don’t have the time – I’m sure that’s the most common defence used by people making excuses about not contributing, but well it’s just the case. If I’m not going to contribute then maybe I shouldn’t be complaining. However when you see open-source projects like Ubuntu massively increasing their GUI and UX with dedicated people working on improving overall aesthetics, you realise that it’s actually a very important factor in driving increased adoption of open-source systems by a wider audience. More details on Ubuntu’s Ayatana Project can be found here. Perhaps OpenOffice has a similar project of which I’m not aware, but if they don’t I think they should consider starting one.